I live by two basic principles. The first is to always take the opportunity for an All Day Breakfast when it's on offer, and the second, is to make sure the All Day Breakfast has Eggs Benedict on the menu. 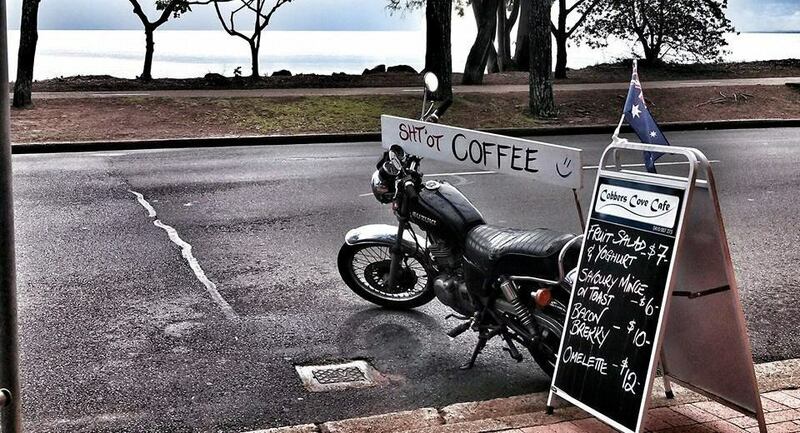 So being a man of great principle I stopped off at Cobber's Cove Café, 322a Charlton Esplanade, Scarness, Hervey Bay. You can't miss it and you shouldn't go past it. Cobber's Cove Café is a completely idyllic place to have a meal of any kind, a coffee or even something called a frappe – I believe it's a drink make from fresh fruit; I know it's not coffee so I am unable to comment further. When I arrived the place was buzzing, not least of all because of the excellent music being played (none of that hip hop, beep bop here), but my order was received with a lovely smile and an offer to take a seat and it will be right out – and it was. In no time my Eggs Benedict and mug of flat white were sitting on my table. The coffee was superb and, best of all, it was HOT – apparently, Cobber's Cove Café's boast is their coffee's 'sht ot'. 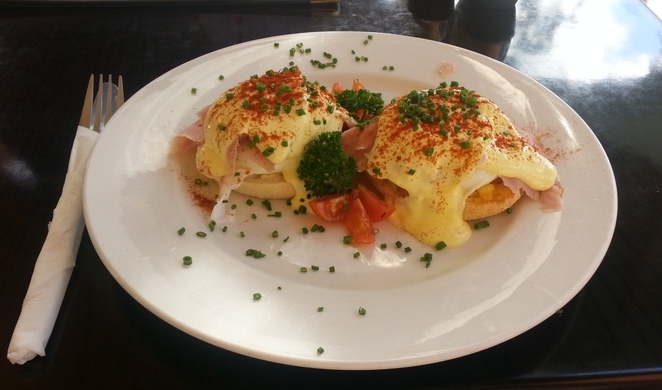 Just like the flat white, the Eggs Benedict were fantastic. For me to like my food it has to have strong, distinct flavours and this meal had those in spades. I especially enjoyed the sprinkling of chives that gave the dish a slightly different flavour and texture. As usual, I had my Benedict with ham but you can also get bacon or salmon with it. To help in the digestive process the Café is situated on the Bay with a sensational view from the al fresco tables. People pay millions to have a view like it and all I paid was $15 for the Eggs Benedict and $4 for a mug of beautiful flat white coffee. Other meals are available including wraps, sandwiches, cakes, light meals and full lunches with everything being cooked to order. Cobber's offers simple foods cooked to perfection with plenty of Gluten Free options available. There is also a wide range of hot and cold drinks available. The Café is open from 6.00am until 2.00pm every day except Tuesday, when it's closed, and Sunday when the hours are from 6.00am until 12.00midday. If you are up around the Esplanade at Scarness and feel like a coffee of something to eat then you couldn't do any better than to tuck in at Cobber's Cove Café. 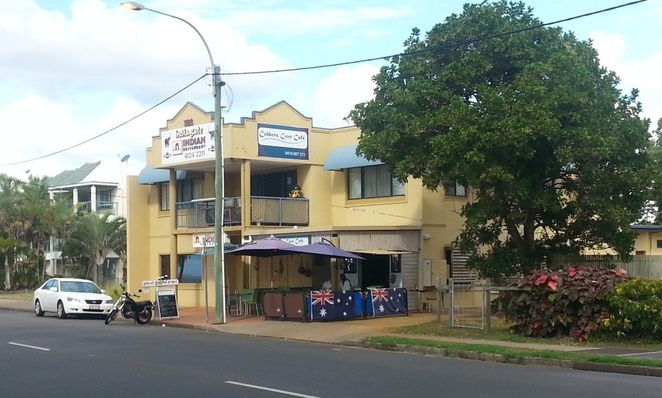 For more information have a look at their Facebook page here or call the Café on (07) 4194 1455. Of extra interest is the collection of beautiful sunrise photographs included in the Café's Facebook page. 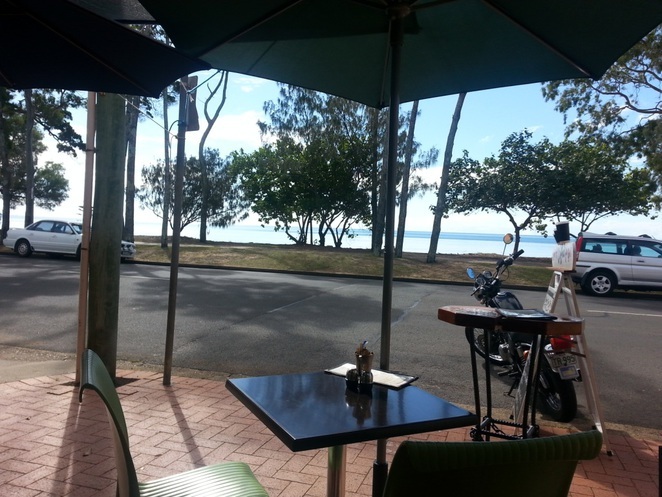 They give you a daily image of the changing beauty of Hervey Bay.